The thing I’ve really learned about blogging over the last couple years is to find out how people are getting to your site. I watch search engine turns pretty much everyday to see what is bringing people to my site. It helps make decisions on where to eat. If there’s someplace that a lot of people are searching that I haven’t blogged yet, it’s pretty much a no-brainer on where we need to go next. One of our first week’s in town, we came across a Chicago-Style place near Western Michigan. It’s only been open a few weeks, so there’s not much out there in the way of info on the place. Now, I’m always skeptical when I see a “Chicago-Style” anything outside of Chicago. It’s always a variation on the style or something that has been shipped here. Still, we decided to give the place a try. 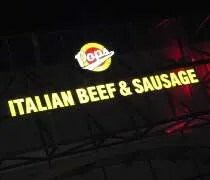 Pop’s Italian Beef & Sausage is on Howard Street in Kalamazoo in the Campus Point Mall. Pop’s is actually a Chicago chain. I had no clue. I’ve eaten a lot of Italian beefs in Chicago and since meeting J, I’ve gotten to know the south suburbs pretty well and I’ve never seen a Pop’s before. They do exist though. There are seven locations in the Chicagoland area and two in Indiana. 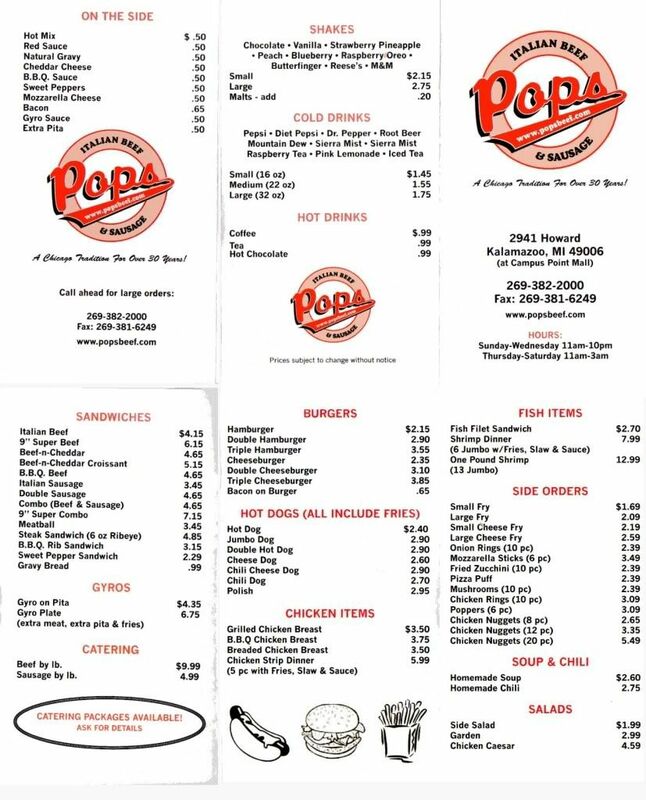 Even though I had never heard of Pop’s until moving here, they’re actually a favorite of one of J’s friends. We were over at his house this past weekend in Alsip and he was drinking from a Pop’s glass. Earlier that afternoon he stopped in to one of the Illinois locations. 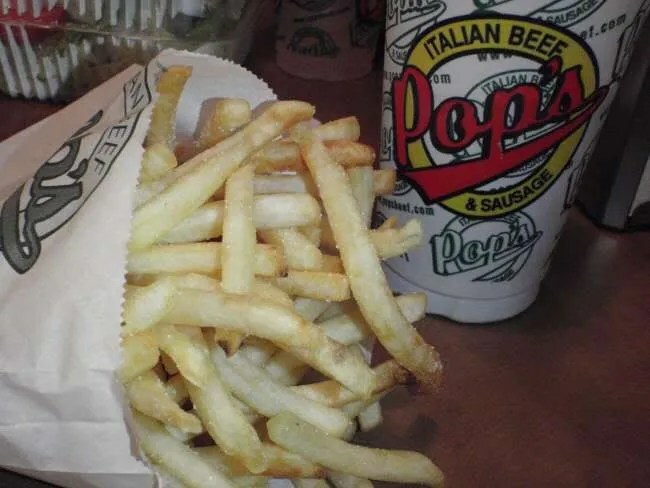 Pop’s is what you hope for when you see the word Italian beef. It’s not a huge, fancy restaurant. You order at the counter then you’re given a number while your food is prepared. There are some booths in the small dining room, but the thing that makes it authentic is the counter that runs along the windows. I don’t know what it is about Chicago hot dog joints, but eating your meal while watching people walk by on the street is the thing to do. If you’re utilizing this space properly, you would forgo the chair and employ “the hunch”….that is, stand a foot back from the counter, spread your legs for stability, put your elbows on the counter, and lean into the sandwich. This helps if you’re on your lunch break and don’t want to get gravy on your white dress shirt. Anyway, the space is reminiscent of Chicago, but they don’t forget where they’re at. The walls are covered in Western Michigan University memorabilia and historic photos. J ordered first and decided on the chicken strip dinner which comes with fries and coleslaw. She also go a side salad and a small pop. She asked for both ranch and BBQ sauce with her chicken strips. When our number was called, she was missing quite a bit. The salad was not in the bag and there was no BBQ sauce. She had to make two trips back to the counter to get all of her order. She was a real big fan of the chicken strips. They were thin and had a great breading that was just right. There were no big clumps of breading that looked like it should have had some meat hidden in it. The fries she got with the meal were thin and crispy restaurant fries. There was quite a bit of salt on them, but it didn’t seem to bother her. Still, she had a lot of food and only ate about half of the fries. The side salad wasn’t much more than iceberg lettuce, a cucumber, and a couple tomato wedges, but there was a lot of it. She was really happy with the portion even though she didn’t finish. She offered the salad to me, but I told her she should have left me some chicken instead. She disagreed. The chicken was too good to hand off to me. 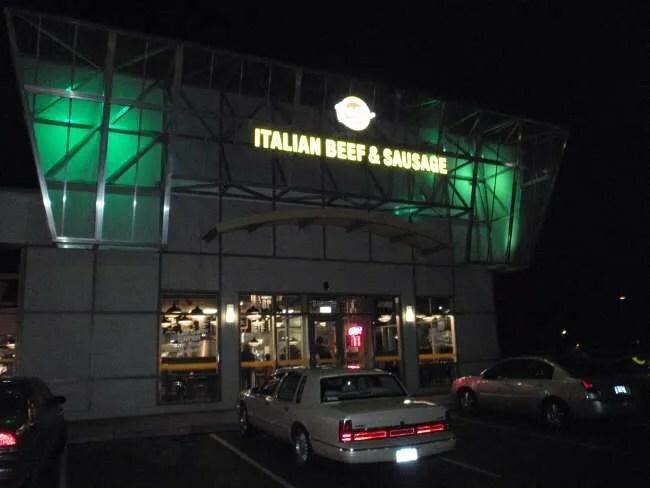 I got the Italian beef. Right behind hamburgers, it’s probably my favorite food. 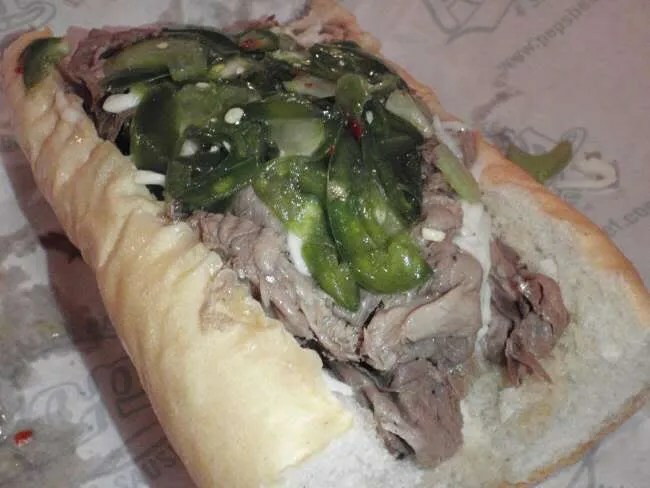 I crave it even more because it’s so hard to get a good Italian beef outside of Chicago and I haven’t lived in that area for quite some time. I got my beef with hot peppers and mozzarella cheese. Both were add-ons and cost an additional fifty cents. I also got a small order of fries and a medium pop. The beef was everything I was hoping for. The meat is made and sliced in-house daily. It was super tender and really fell apart in my mouth. The bun was a hoagie roll that had a little bit of gravy seeping out. I should have asked for it dipped, but it was still good the way it was. I wasn’t a huge fan of the peppers. They didn’t really have the pickled taste that I really like. They were jalapeno’s that had been sliced paper then and there was definitely a pickling liquid, but they still had too much of a fresh pepper taste. There was a lot on there and I took off about half. They still had some heat and definitely made the sandwich more authentic. The small order of fries was enormous. I thought they screwed up and gave me the wrong ones, but the little paper bag was the right size and it was stuffed full of fries. They were a little over salted, but I still finished them off. After I licked my fingers clean, I considered going back for as second beef. Yes, it was that good. Our bill was pushing twenty bucks, but just about every thing you add is going to cost you extra. It’s still not a bad price. I’ve paid more for less at some of the other Chicago beef places. As we were finishing up the meal, a man who I believe was the owner came over and asked how we liked things. We both told him we were big fans and we mentioned the fact that we were from Chicago. He ripped on J a little for getting chicken strips, but she confessed that she’s not much of a beef eater. He told us there was another sandwich they have on their menu, but is not actually on any of the written menus due to a printing error that most of the ladies have been getting. It’s a pita that comes with the chicken strips and a lettuce, etc. As we were finishing up the conversation, he asked us to spread the word. I didn’t tell him that I blog, but we both assured him we would pass the word. 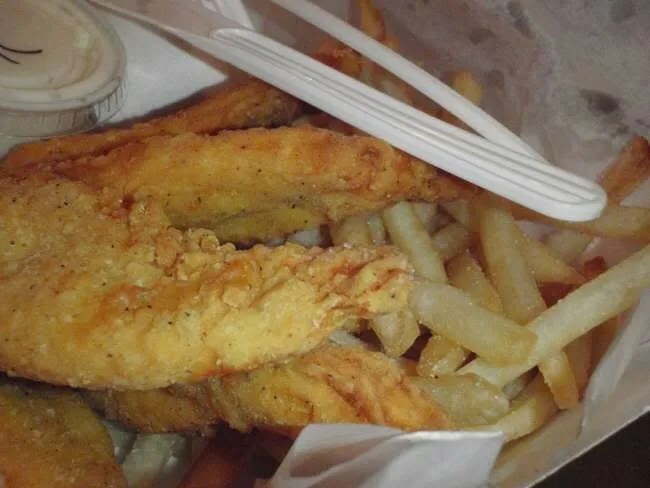 If you’re a Chicago transplant, Pop’s is a little taste of home. If you’re not, this is what you’re missing out on. The walls are covered with Western Michigan University memorabilia not Western Illinois University.